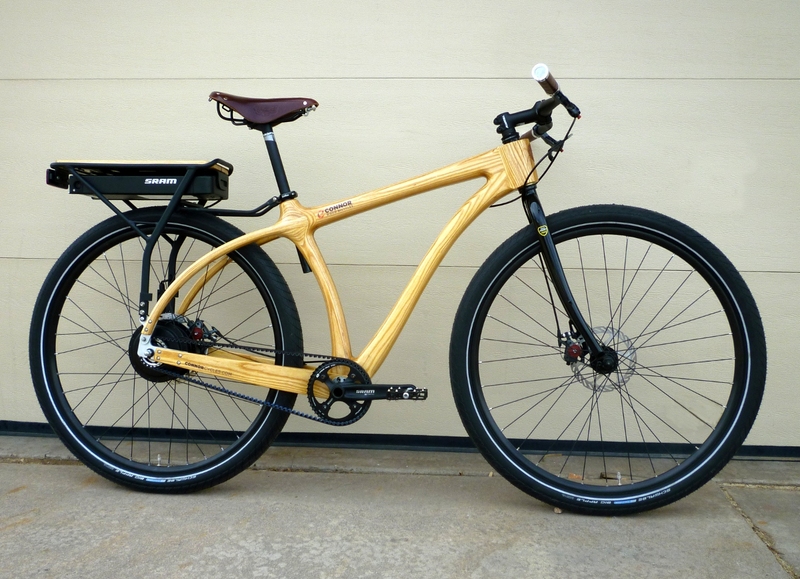 Electric – Connor Wood Bicycles — Wood bikes from Denver Colorado. It’s wood, it’s electric! The e-Woody takes the great ride and simplicity of the Woody Scorcher and adds an electric hub. This smart system requires no throttle and knows when to provide power and when to regeneratively recharge while you’re riding. Technically sophisticated but functionally simple, this bike gives 50miles of riding range and an elegant rack to take your things with you. Great for commuting, around town, or just for fun. The e-Woody uses the new SRAM e-motion hub and battery pack and is coupled to the drivetrain with a Gates belt drive. It has amazing power which is applied quietly and efficiently making for a great ride.